It is one of the first vegan and vegetarian restaurants in Lagos. Established by Hakeem Jimoh in May 2013. It serves mainly vegan and vegetarian dishes, including fresh and delicious traditional, pan-African and western style dishes and snacks. Its menu includes delicacies like Veggie and Patty Burgers, Soy Hot Dogs as well as Nigerian stews like Egusi and Efo Riro. Other vegan and vegetarian specials on their menu include wheat protein, Tofu Scramble with Yam Chips, and vegan pepper soup. The chefs here use Tofu and wheat protein to offer you meatless versions of the Nigerian and North African local dishes such as shawarma and suya. There are no soft drinks on the menu; instead, they offer smoothies and juices, made of a blend of seasonal fruits as well as the shakes with Soy Milk or Soy Yoghurt. This is to ensure and promote proper healthy eating and living, which is the essence of a vegan and vegetarian diet. 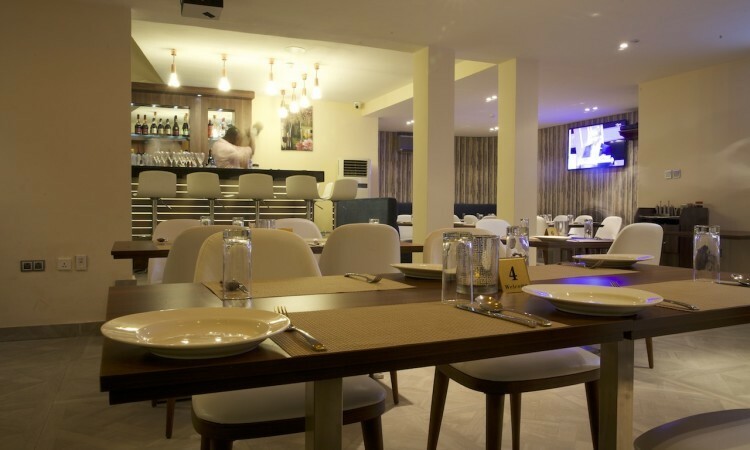 Spice Route, formerly known as Spice Bar, is one of the most pleasant vegan and vegetarian restaurants in Lagos known for its excellent food, lovely ambience, superb decor and a reasonable price. It offers mainly Asian delicacies such as Vegetable Samosa, Pakora, Onion Bhaji, Tandoori Chicken, Seekh Kebab, Butter Chicken, Chicken Madras, Chicken Tikka Masala, Chicken Curry, Lamb Saag, Lamb Madras, Lamb Nawaabi, Beef Madras, and Paneer Makhani. There are vegan options dishes and their delicacies are vegetarian-friendly. This restaurant is said to be one of the best vegan and vegetarian restaurants in Lagos that offer fantastic delicacies. Craft Gourmet by Lou Baker is a lovely place for lunch and dinner. The menu, which includes Asian and European delicacies, is vegetarian-friendly with vegan options. It offers an assortment of bread, pastries, cakes, desserts, salads, smoothies, beverages, cocktails and more. Do you crave delicately prepared Japanese cuisines in a tastefully furnished environment? Then, look no further than Izanagi Japanese Cuisine for the best in the world of Japanese cuisines. The menu is vegetarian-friendly, comprehensive and alluring. It also allows customers to use tablets for their meal order. Its delicacies include Spider Roll, Crazy Shrimp, Rainbow Maki, Sushi, Beancurd, Chicken Ramen, Sashimi Platter, and a variety of salad, soups and tempura dishes. This restaurant is beautifully decorated with orchids around, both inside and outside. The food here is reasonably priced and the delicacies are satisfying, in addition to being vegetarian-friendly, It serves delicacies like Prawn Tempura, Shrimp Roll and Tom Yam Gai (Soup). Your meal there wouldn’t be complete if you don’t taste their excellently prepared Pad Thai Gai (Indomie) and Pa Naeng Kung (Curry). Eating a meal at this restaurant takes you on a trip to Bangkok and back in minutes. The taste of their exquisite delicacies would almost make you forget that you’re in Lagos. This restaurant adequately captures the caption ‘food for your body, music for your soul’, through their excellent and charming live music. It is very child–friendly, has a bar & a lounge alongside providing outdoor seating. This is one of the most welcoming vegan and vegetarian restaurants in Lagos with good service and friendly staff. It offers the best of Indian dishes such as the Tandoor specials, made from wonderful fresh ingredients with a perfect balance of spice and richness. The menu has vegetarian delicacies as well as some continental specials. The restaurant features include reservations, takeout, private dining, and delivery. It also serves delicacies Lamb Sheesh Kebab, Chicken Tikka Masala, Gulab Juman, Plain Rice etc. This is one of the most classy and lovely vegan and vegetarian restaurants in Lagos. Its menu is vegetarian-friendly. It offers Bulgarian & Lebanese Cuisines alongside some Italian cuisines. Its menu includes Meat Hummus, Kebab, Seafood, Spaghetti Bolognese etc. It also offers services like outdoor seating, bar & lounge, among others. So you want to have a taste of a what vegetarian meals taste like around the world and you’re probably wondering how you would go about it. Well, good news, you don’t need to think too much. Presenting to you, the world of vegetarian meals, live in Lagos. The Italian, Indian, Bulgarian, Lebanese, Nigerian and Asian dishes are sure to leave you asking for more. So, when next you want to have the taste of an excellently prepared vegetarian meal in a serene and exquisite environment, visit any of the restaurants listed above, and you will not regret that you did. Warning: You may be tempted to bite off your fingers after each meal but don’t, just ask for more. For the foodie, Ikeja is an amazing place to be as there are numerous nice spots to eat at. Check out this list of the best restaurants in Ikeja. Find the best restaurants to enjoy a movie at. Either alone, with family or with friends. The Chinese have a lot of delicious delicacies and mouth-watering cuisines. Looking at having a taste? Here are a few restaurants in Lagos you can visit.